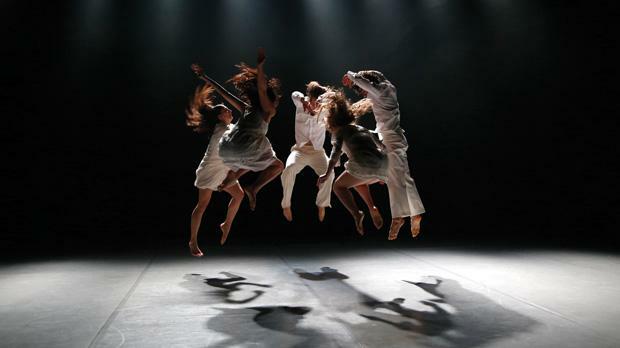 ŻfinMalta, Malta’s first national dance company, launched its first season with the production Erbgħa(4), featuring four pieces by different choreographers, at the MITP. Choosing the piece to open this highly-anticipated event must not have been an easy task for artistic director Mavin Khoo. It had to draw in an audience which has been waiting for such an event to take place for years. The chosen piece, Selah, successfully achieved this and more. A powerful work, choreographed by José Agudo to music by Vincenzo Lamagna, Selah starts off at a slow place, with the calculated movement of the five dancers to the sound of church bells – a familiar sound to anyone in Malta. As the piece progressed, Florinda Camilleri took the lead with captivating passion and emotion while maintaining perfect timing and control. Even at the quietest and most simple moments, all eyes were on this dancer and her sharp, energetic movements. Mirroring this was the equally passionate Keith Micallef who added another dimension to the piece, as did Caroline Mougenot, Kostas Papamatthaiakis and Martina Zammit. As Camilleri and Micallef struggled with each other and themselves, they managed to balance each other out, making Selah a flowing piece, even at its darkest moments. This was mainly evident during the impeccable representation of the moment of rupture where the dancers’ movements were further enhanced with shadow play and high, screeching sounds. The second piece, Iż-Żmien by the company’s only Maltese choreographer, Francesca Tranter, and with music by Walter Micallef, was a much lighter work. The choice to include a solo at a launch of the first season of a dance company was a bold, yet effective one. Papamatthaiakis shared the stage with Micallef who gave an acoustic rendition of his ballad Iż-Żmien. The connection between Papamatthaiakis and Micallef was evident throughout the performance, but without it overshadowing the choreography. Papamatthaiakis oozed emotion, especially during the most gentle and intimate parts of the song, which is about the passing of time and what has been achieved or lost over the years. The piece was sharp and full of energy at times, while softer at other moments and, occasionally, also somewhat comical. This required immense control of movement, which Papamatthaiakis achieved with sharpness and well-timed motion. The use of a prop, an apple, added another dimension to the piece and gave Papamatthaiakis, albeit in a solo, the opportunity to make a connection with something, allowing him to tap into a greater range of emotions. The third piece brought all eight members of the ensemble to the stage. They were also joined, at parts of the performance, by the company’s two apprentices. This was the first and only time during the evening that the whole ensemble performed together. Stabat Mater, choreographed by Khoo to music by Girolamo Abos, is a very spiritual piece where the dancers are taken over by grief and ecstasy. The work takes the form of a ritual with each dancer going through different emotions and experiences while remaining bound together as one ensemble. This was interesting to watch as each dancer’s unique skills were brought out without any single one overshadowing the rest. The energy of the group was consistent throughout the 20-minute performance, even as this became more complex. The fourth and final piece, Kick the Bucket, a work by Iván Pérez Avilés to music by Aaron Martin, brought to the stage Khoo and Gabin Corredor. Watching Khoo perform is always a treat. The artistic director has been striving to take dancing in Malta to a higher level for a good number of years now, and if Erbgħa(4) is any indication as to what he has in mind for this company, great things are in store for ŻfinMalta. Corredor complemented his partner and together, the pair gave an emotional performance that while at times may have seemed somewhat effortless, was actually very intense and quite complex. Through heavy partner work, a relationship between the two evolved, with each dancer contributing his own share of emotions to this relationship. Having a national dance company is a dream for some who have strived for years to give dance more prominence. ŻfinMalta seeks to develop works by both local and international choreographers which inspire other dancers, as well as audiences. It also seeks to further develop and maintain a Maltese identity. Through Erbgħa(4) the company proved it is on the right track to achieving all this. At the end of the evening, the audience was not only left mesmerised with the dancers’ level of technique and passion, but also, finally, reassured more of such high-level productions are to follow. • ŻfinMalta will also be performing Erbgħa(4) tomorrow at Astra Theatre, Victoria, at 8pm.